Stress Ease™ Ayurvedic formula. The term “Ayurveda” is derived from the Sanskrit words ayur (life) and veda (science or knowledge). Ayurvedic medicine is over 3,000 years old and originated in India where it has been handed down from practitioner to student through the millennia. Ayurveda uses a combination of herbal compounds, diets, and other unique health regimes. This review specifically examines the product Stress Ease™ tablets, an herbal compound formula. 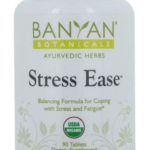 What are Bayan Botanicals Stress Ease™ Tablets? Stress Ease™ Tablets is a specific blend of Ayurvedic herbs that is formulated to relieve stress naturally. Stress Ease™ Tablets (not capsules) are the result of herbal compounding of specific certified organic herbs that work together to promote relief from stress and anxiety naturally. Stress Ease contains adaptogens, specific herbs that help your body-mind “adapt” to stress by soothing your nervous system and hormonal glands. Important glands in the stress equation are your adrenal glands because they release stress hormones (such as adrenaline and cortisol) when you become stressed, anxious, or overwhelmed. Adaptogens help smooth out the rough edges of your body’s response to incoming stressors, like fighting heavy traffic and the everyday oncoming stressors that seems to be all around us. What’s In this Ayurvedic Formula? Unless you’re an expert in Ayurvedic herbal medicine, selecting the most effective ingredients can be a daunting task–and an unnecessary one. While many people may be familiar with ashwagandha and other relatively common Ayurvedic herbs, the herbs are reported to work better together for stress relief. The Ancient Science of Ayurvedic medicine is highly refined and uses combinations of herbs that have a synergistic effect. In other words, the herbs work better together than individually, an herbal blend. Other ingredients, from natural sources: organic gum acacia, organic rice flour. Free of gluten, soy and dairy. 100% vegetarian. Note: does NOT contain magnesium stearate, a potentially hazardous additive. Who is Stress Ease™ For? Stress Ease is beneficial for those of you prone to fatigue and feeling overwhelmed due to chronic stress in their lives (who isn’t these days!). It’s easy to form addictive patterns to substances that are not so good for us when we are under ongoing stress. This product is great for people who are looking for ways to help relieve stress naturally. Stress Ease is an excellent choice for the discriminating buyer who is conscious of what s/he is ingesting. 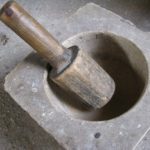 While many herbal products have the same herbs in name, they often not be of the same quality, potency–and some products contain potentially toxic “flow agents” in their products, such as magnesium stearate. If you have been under stress for a long time, your adrenal glands have likely been working overtime and need some support. The herbal combination in Stress Ease targets the adrenal glands, a welcome relief. Be sure to combine herbal therapies with other healing activities such as meditation or Kundalini Yoga, sister sciences to Ayurveda. As always, when taking supplements, please check in with your health care provider to ensure there are no contraindications for you specifically. Please note: high ama, use with care during pregnancy. Unlike the jolts of temporary energy you get from caffeine-rich beverages or sugar, Stress Ease delivers a sustained source of natural energy that prevents the “energy crashes,” the feeling you get when the caffeine or sugar high wears off. This is a balancing formula for coping with stress & fatigue that gets high marks from satisfied customers. Stress Ease helps your body cope with stress by supporting the resiliency and tone of the neuro-muscular system. Stress Ease™ Tablets gives people a feeling of being grounded. Numerous people have reported in their reviews that it has helped them sleep better. So if you have trouble sleeping due to chronic stress you might consider giving Stress-Ease a try. When is the Best Time to Use Stress Ease™ Tablets? When taken before bedtime, many people have reported sleeping better. If you anticipate a stress situation take Strss Ease beforehand, or if you feel like your stress level has just spiked. Please follow the instructions by the manufacturer and do not exceed recommended daily dosage. 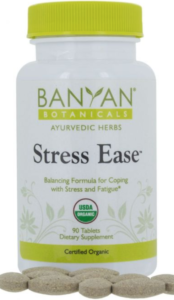 Banyan Botanicals Stress Ease™ tablets are high quality tablets that get high marks by reviews who report its effectiveness in taking the edge off stress, naturally. This product gets high marks from me because of the quality (certified organic), inspections by independent 3rd party certifying agencies, and the lack of questionable additives. I really like the Ayurvedic approach to natural remedies which looks at the combination of several herbs as being more effective than the sum of parts (the individual herbs). The herbs have a synergistic effect and the result is a more effective product. Some people however, only want to introduce one substance into their body’s at a time, which is the best approach for some people. Stress Ease™ tablets are not the cheapest stress formulated product on the market, but I view quality supplements as “cheap insurance” for your health (this is not a health claim, it is my opinion and one that I live by). If you’re like me, I also feel that it is important to support companies that are working towards improving sustainability and have an ecological holistic mindset–not just worried about the bottom line. Banyan Botanical is such a company. 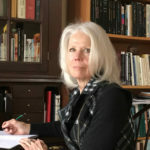 As the founder of HowToRelieveStressNaturally.com I would love to hear about your experience with Oregon Wild Harvest Stress Guard. Please leave a comment below to share your experience or to ask questions that you may have.